I respect your perspective and fellow real estate professional s who choose to provide full services for a full fee. But wouldn’t you agree that the internet has been unbundling real services for more than a decade, and buyers and sellers can benefit from the "best of breed" services without paying a full commission? So, why not encourage individual sellers to do their own math? If they (1) can do some of the work themselves, (2) pay to use self-service tools online, and (3) hire fee-for-service real estate consultants on an hourly fee to do other tasks, some may conclude that will "translate into more dollars at closing" than hiring with a full fee agent. Pricing within the call capture industry is very competitive – base monthly costs are comparable to cable television bills in our market. No reason to pay a full commission for this benefit. If the goal is to "publishing your listings on as many Web sites as possible," why should full fee sellers be content to syndicate content to 30 sites via Post2Agent.com when a FSBO friendly site like Fizber.com syndicates listings to 80 sites for a flat fee (about the cost of two print newspaper ads in our market)? Video can be an attention getting upgrade, but is not essential. Still, prices at the best real estate video solution providers start under $1,000 and syndication via TubeMogul.com appears to be FREE. Yes, OBEO.com’s StyleDesigner is magic and sellers can turn a liability turned into an asset by giving buyers the opportunity to do their own virtual "makeover." But that upgrade cost less than most entrees at upscale restaurants in our market. The ever expanding menu of money-saving real estate tools makes tracking an important tool for do-it-yourselfers to assess cost effectiveness. Value-conscious sellers can use tracking tools to (1) decide when they need to purchase more tools or services from a real estate consultant, (2) when to change their price, and finally, (3) when they can save more money be working with a full service, full fee agent. So doesn’t it make sense for real estate consumers to consider unbundled service providers before concluding they can save money money by paying a full commission, particularly when some listing entry only and fee-for-service real estate business models offer service or money-back guarantees, too? I’ve spend the morning deconstructing her article because it’s really hit a hot button for me. Her concluding question — Why did so many people, including Realtors, buy homes in 2005? — has been and will continue to be the basis for innumerable blog posts, talk show interviews, research by economists — imagine what the authors of Freakonomics could do with this confession — not to mention parodies on Saturday Night Live and YouTube. There is more work still to be done. Personally, I’d love to see investigative reporters dig into the conflicts of interest in the real estate industry and expose how deceptive and manipulative business practices, like dual agency and bidding wars, fanned the flames of “irrational exuberance and, as Teresa’s article admits, ultimately burn Realtors themselves. Perhaps industry regulators will create new disclosures to protect consumers and prevent another trillion dollar collapse of the housing market in the future. For example, buyers are routinely advised to ask agents about their sales volume, but what if they asked prospective buyer agents if any past clients are upside down on their mortgages or involved in foreclosure? What if a “foreclosure disclosure” were required by law? Outrageous and unrealistic some might argue but blogs have already created a decision-making tool for web-savvy home buyers to decide who will best protect their financial interest. Try this experiment, visit two real estate blogs and see what they’ve written about the housing bubble. Go back to 2005, were those two prospective advisors echoing NAR’s “anti-bubble” spin or warning homebuyers about the coming meltdown? Compare what Teresa was blogging about in November & December 2005 to The Real Estate Cafe’s history of blog posts about the real estate bubble. 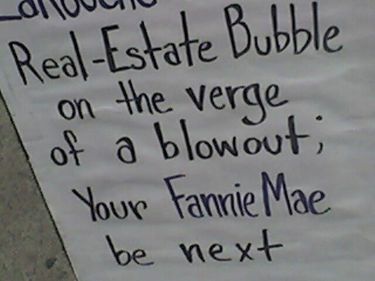 In retrospect, this April 2005 blog post sounds prophetic: Will mobloggers pop the real estate bubble? My hope is that Teresa’s admission that Realtors are not immune to foreclosure will expand discussion about systemic flaws and conflicts of interest in the residential brokerage practices, and their cost not just to individual buyers and Realtors but to society. Who could imagine a better time and place for some “straight talk” about the need for reform than the eve of John McCain’s speech at the Republican Convention right there in Teresa’s backyard?